Did you know I have a Recipes page? And did you know that it's chock full of fabulous recipes? 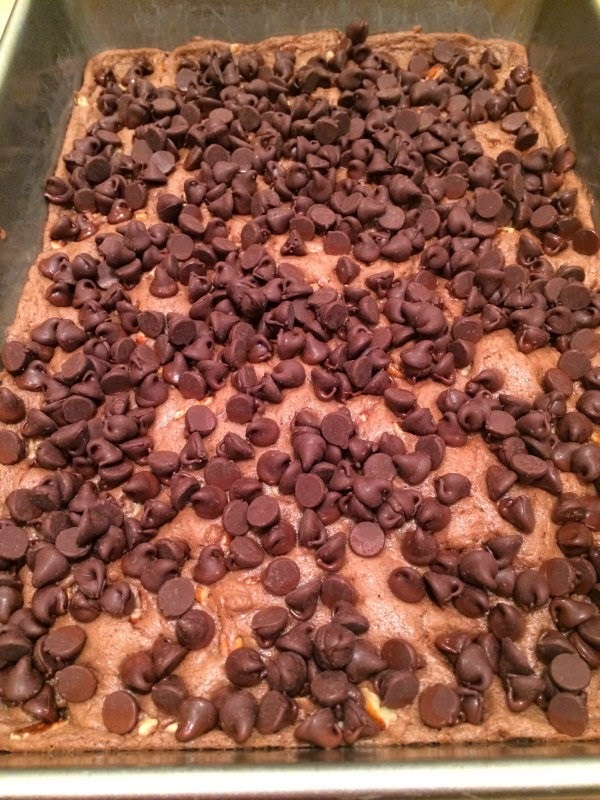 For a long time I posted a Fabulous Friday Food recipe each week. But then I stopped cooking or got tired of it or felt like it was too much work. Or something like that. I've been thinking about resurrecting Fabulous Friday Food for a long time now, but wasn't sure if I had the energy for it or not. But will Fall being here and all of the wonderful food that comes along with it, and also when I realized this week that I've never even blogged my famous chili recipe (stay tuned . . .), I decided that it's time. And then when my friend, Rebecca, told me this week that whenever she doesn't know what to make for dinner she just looks on my blog . . . well, that was all I needed. 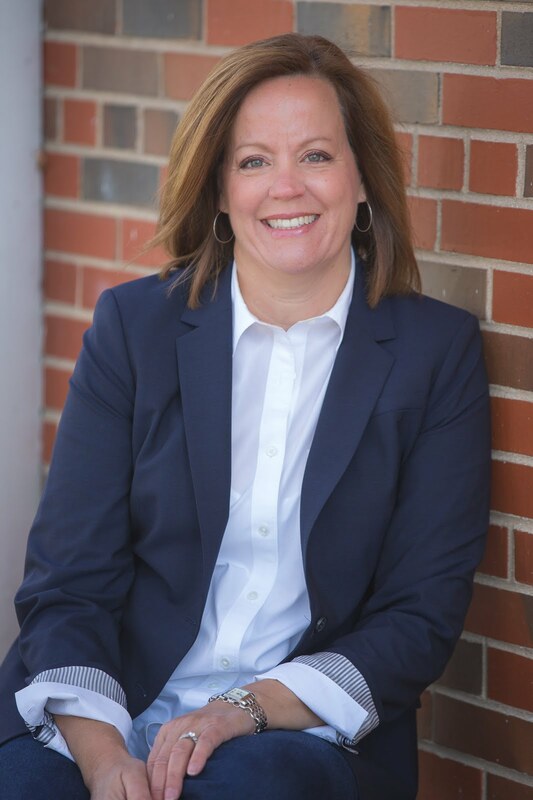 Thanks for the push, Rebecca! But here's the deal--I need your help. If there's something you'd like to see here on FFF, would you let me know? If you have a cooking-related question that I can answer, would you ask? Maybe that will help me think of something to write about on Fridays. And if you're new to Fabulous Friday Food (little shout out to Ina Garten in the title because she's just fabulous), let me know that as well. I hope you get a little inspiration here and some encouragement to keep cooking. I know I need that sometimes! 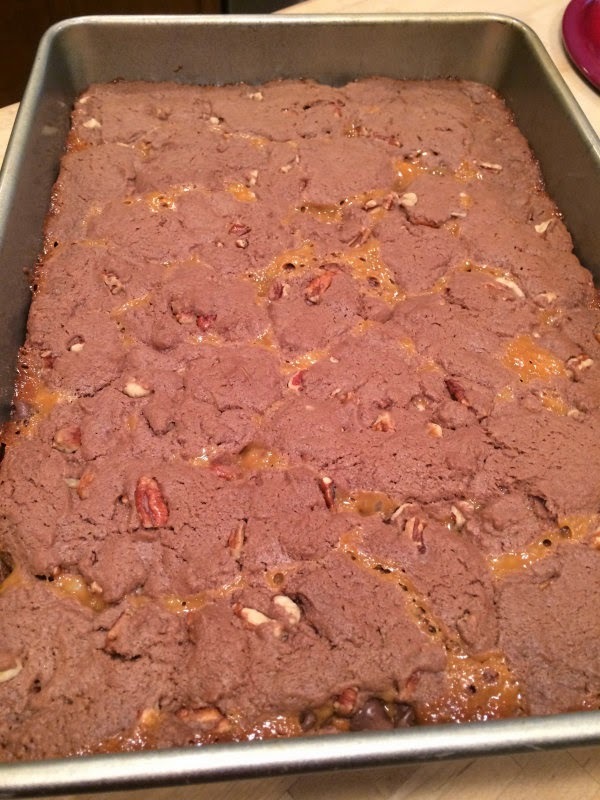 This week I'm making these bars that go way back in our family history. My mom made these when I was growing up, and she always called them "Illini Bars," I think because my parents would take them to tailgate parties at the U of I way back when. I'm not quite sure where they got the name. 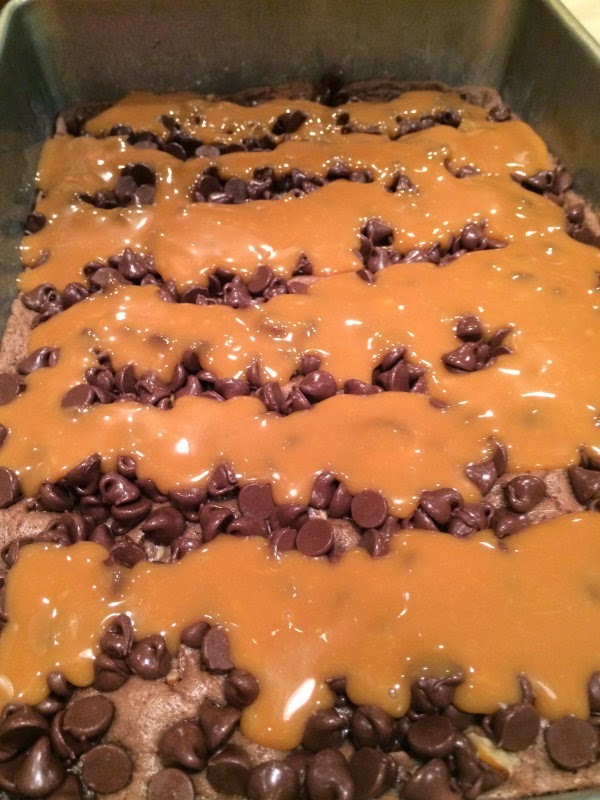 Basically, these are caramel brownies or turtle brownies or something like that. But at our house, they are Illini Bars. These are an autumn staple around here. I'm not even sure why we only make them in the fall, but, again, it must have something to do with football games. All I know is that when the weather turns, it's time to make Illini Bars. 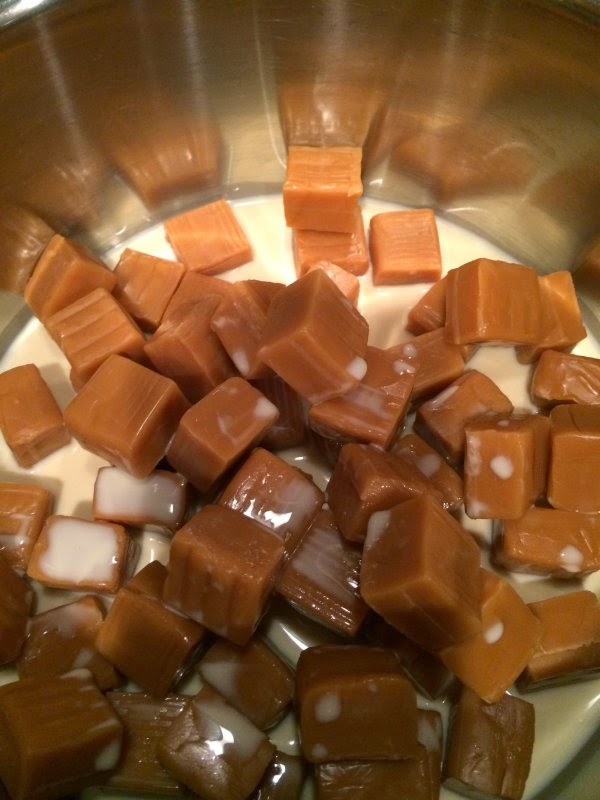 In a saucepan, melt the caramels with 1/3 Cup of evaporated milk. Here's something that drives me crazy. Back in the day, when Mom was making Illini bars, a package of caramels was much bigger than a package of caramels today. So if you choose to only use one package of today's caramels, you'll probably get a runnier, less-caramely consistency to your filling. Trust me on this one. Use a package and a half of caramels. You'll be glad you did. While the caramels and evaporated milk are getting acquainted on the stove (low heat, please! ), melt 3/4 cup of butter (that's a stick and a half). 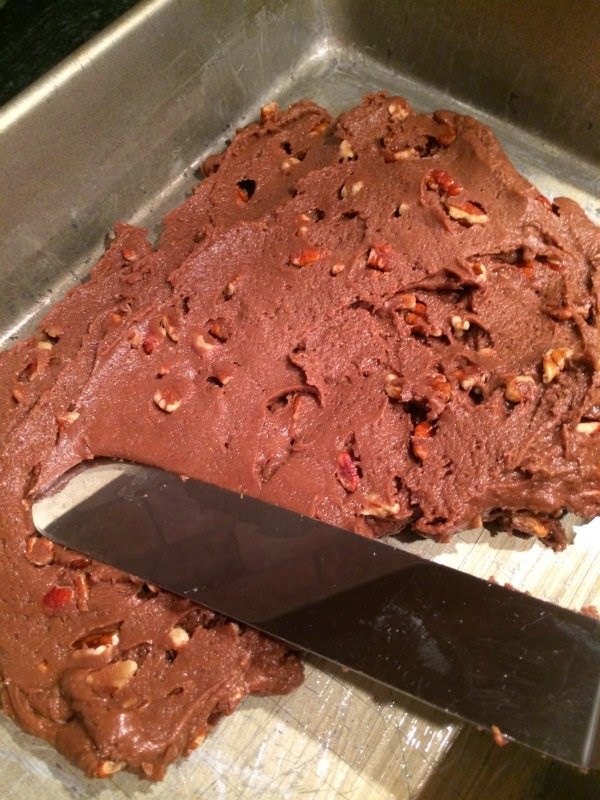 In another bowl, mix together the German chocolate cake mix, the melted butter, another 1/3 cup of evaporated milk, and the 1 cup of chopped pecans. You can leave out the nuts, but why would you? Take half of the chocolate cake mixture and press it into the bottom of a greased 9x13 inch pan. You can use a spatula, like I did, or your fingers, which work just as well. Just make sure you get the whole thing covered. Now bake this for six minutes at 350 degrees. After six minutes, take the pan out of the oven and cover the mixture with chocolate chips. Put the pan back into the oven for just a couple of minutes until the chocolate chips melt. Now add the melted caramel to the top of the chocolate chips, like this. You don't need to spread it out--the oven will take care of that. Now take the rest of the cake mixture and place it on the top of the caramel. This is the only tricky part of this recipe. The cake mixture will be kind of thick, so you won't be able to pour it on. What I usually do is take small pieces and pat it out into a flat disk and place it on top. Don't worry. Everything will work out in the oven. The funny thing is, we gobbled these up so fast that I didn't even have time to take a picture of the finished product sitting pretty on a plate like most "real" food bloggers would do. Trust me, they are THAT good. So, have a wonderful Autumn weekend and go bake some Illini Bars! 1. 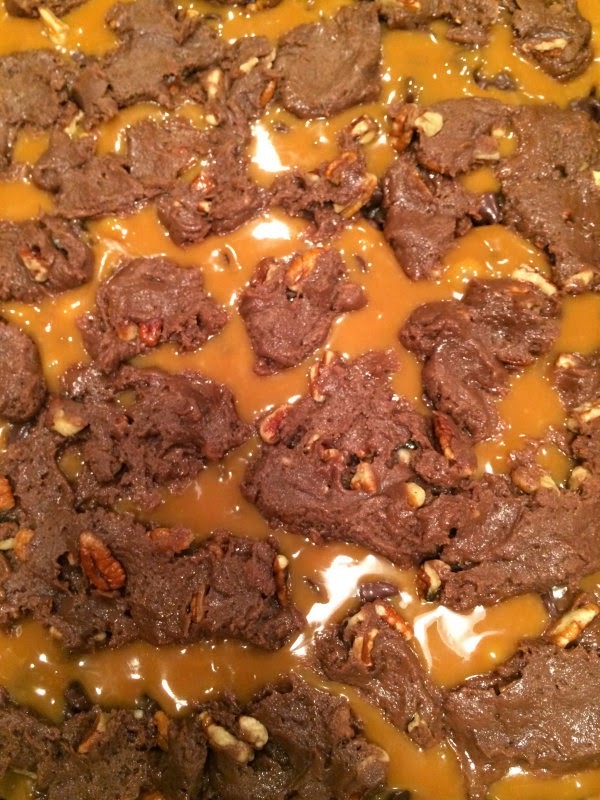 Melt caramels and 1/3 Cup evaporated milk over low heat, stirring occasionally. 2. 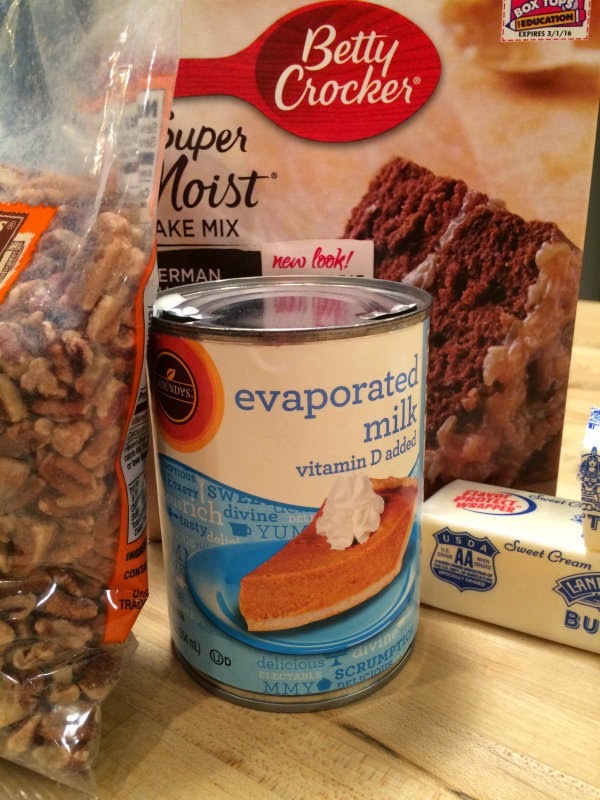 Mix together cake mix, 3/4 C. melted butter, 1/3 C. evaporated milk, and 1 C. pecans. Spread half of the cake mixture in the bottom of a greased 9x13 inch pan; bake six minutes at 350 degrees. 3. 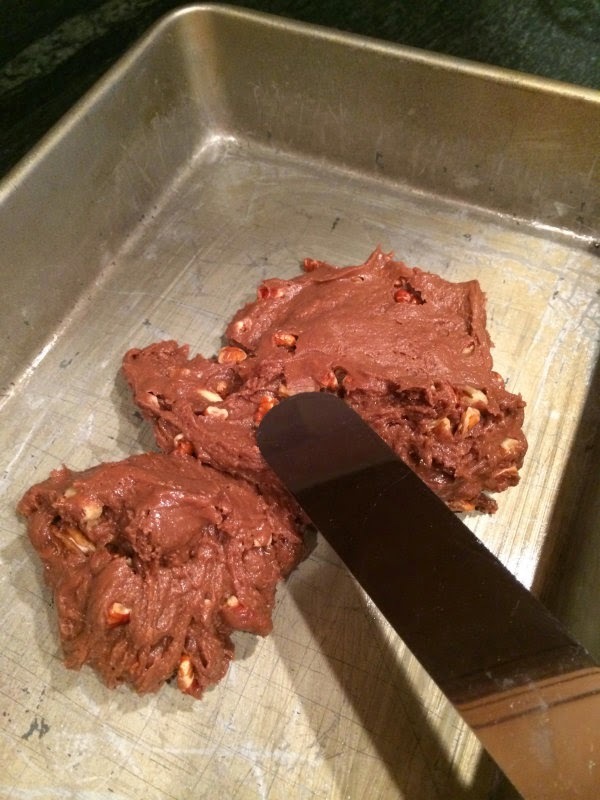 Add chocolate chips to the top of the baked mixture. Add caramel mixture. Add rest of cake mixture to the top. Bake 15-18 minutes at 350 degrees. Now tell me, what are YOU cooking this weekend? Well shame on me, I never paid any attention to your "Recipes" tab. Yes, absolutely please resurrect Fabulous Food Fridays (and by the way Ina is my FAVORITE)! I am always looking for new recipes. I feel like I fix the same things all the time!! Have a FANTASTIC DAY!! Robin, YES! Check out those recipes! I'm making Loaded Baked Potato Soup, followed by Sour Cherry Pie, & also for another evening Hot Artichoke & Spinach Dip. Have you seen the caramels in little rounds with no wrappers? Just open and pop in the pan to melt. Oh, Mrs. Changstein, that sounds like an amazing food weekend! Glenda, I did use those once, and they were fine, but you still need more than one bag of them. I've made these a gob of times but it has been awhile. Thanks for the reminder!